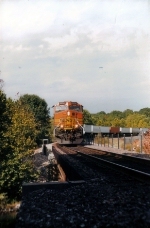 Description: BNSF power on the UP mainline, northbound crossing Arkansas River on the Baring Cross Bridge. Description: BNSF power leads train 204 past the Seneca, SC depot. Description: It's not too often that you see DC power on coal trains here anymore. Eastbound destined for Becker. Description: Trailing as the last DPU. Description: BNSF grain train in Mexico. Description: An Orangebonnet and a Warbonnet charge uphill with a southbound manifest freight. Description: BNSF's Q-STPV-J shoves it's long train into the joint BNSF/Utah Railway Yard. Title: BNSF 4954, BNSF's Aurora Sub.